Article about how Italian politics, of both left and right, came to influence 'ultras' groups in football teams across the country and how it affected the development of these supporters' groups to the present day. "Here in Italy the situation is becoming very hard. I am fed up with hearing insults from our rivals every Sunday and, as time goes by, the situation worsens"
Facing the problem of racism in Italian stadiums means going over the history of curve support (the "ultra" support based on the terraces), to understand both the dynamics that enabled racism and right-wing extremism to spread and the intervention strategies necessary to combat it. The Italian term "ultra" is commonly translated by the English term "hooligan" and this is a platitude that many Italian journalists, together with many foreign observers, like. However, if we check the meaning of the two terms we will soon realize that they do not correspond. The term "hooligan" comes from the name of a gang which was active in the late 1800's in England, famous because of its aggressiveness. This term connotes these supporters directly as thugs, while the term "ultra" is more all-embracing and it will be kept throughout this report. It comes directly from the world of politics (the supporters of the French kings, the post '68 left-wing groups), and denotes political extremism. This difference is the necessary starting point for our study of the history of "ultra" support in Italy. English football hooliganism contributed to the formation of groups of young people expressing support in new and more aggressive ways than in the European context. Yet, in the different national situations, this phenomenon has interacted with some local cultural, social and political elements. These elements determined a different form of development for the ultras compared to the English model. In particular, in Italy the "ultra" phenomenon demonstrated such a degree of autonomy compared to the original English hooligan, that, during the 1980s, it has become its own example for other European countries (in particular Mediterranean countries such as Spain, Greece, the Ex-Yugoslavia Republics, Southern France and some of the Baltic States). In Italy the birth of "ultra" groups took place in an anomalous political context that we should outline roughly. Italy shows a special feature which reached its highest peak between the end of the Second World War and the end of the 1970's. Political conflict involved all social fields; public life. Sports and cultural events were seen as an expression of support or otherwise for a clerical-conservative vision of the world (that in some particular cases could be considered almost pro-fascism) and a vision linked to the Communist left. This opposition was also evident in football, to such an extent that it is possible to outline differences in the teams on the basis of the social status of their supporters and of the geographical areas where the different political ideas were more or less strong. In Milan "Milan" represented the team of the working class (the railway workers in particular), therefore it was considered left-wing, whereas "Inter ' was the team of the middle class of Milan and its suburbs and was considered closer to conservative ideas. 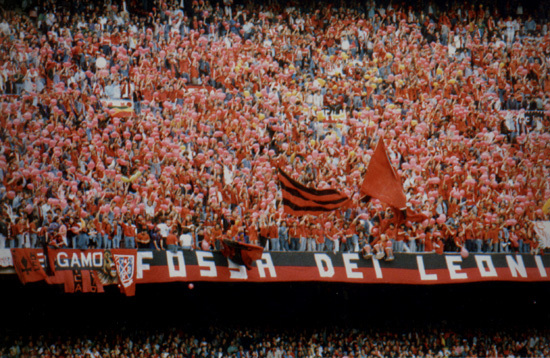 Also the political tendency of a region used to have an automatic influence on the most important teams, therefore in Communist Emilia the "Bologna" team inevitably had left-wing supporters. While the "Verona" team was the emblem of conservative Veneto. This rule applied even to the first supporters groups organized by the team managers in the early 1960s in order to let them deal with the sale of the tickets and the organization of support and away matches. Therefore several "Inter" supporters clubs organized by Servello, representative of the Italian Social Movement [Italian far-right organisation - libcom ed.] and in charge of the team management, were closer to conservative ideas to such an extent that the first "ultra" group of Inter, the "Boys", was born from the splitting up of a group of young supporters belonging to Italian Social Movement. Some "Torino" supporters clubs did not conceal their left-wing sympathies, sometimes exhibiting banners bearing political slogans and often starting fights when coming across fascist meetings. In 1964 the 'Fedelissimi Club" supporting the Torino team attacked a fascist rally in Bergamo. In a strongly politicized context, the advent of the young rebels of the l960s and the consequent birth of the "ultra" groups are not only an expression of social and cultural behavior, but they are also heavily influenced by the political situation. In England, the street subcultures connected to rock music contributed to the birth and development of the rule system which is the basis of organized hooliganism (the strong tie to the territory, very tight access rules, defense against intruders, aggressive behavior and so on). These rules then spread to other European countries through different channels. In Italy, some of these young juvenile styles gained importance and strength precisely during the years of the students' protest (1968-1969) and of the great factory workers' fights and were strongly influenced by them. In Italy the protest movement was not linked exclusively to students, but included large numbers of young blue-collar workers. On the basis of the movement experience, a lot of young people met in groups, sometimes also in small parties, organized according to Leninist ideas. These groups occupied the Italian squares and streets. Facing opposition from the police and by organized right-wing groups. These groups controlled exactly the meeting places where the street subcultures were flourishing. Therefore, the new streets styles and the political reasons started to mix among these groups. It also happened that on the sidelines of these groups, the new young subcultures imported from England combined the rebelliousness typical of the young and the antiestablishment ideas. This was the case for "ultra" groups. The first of these groups was called "La Fossa dei Leoni" (i.e. The Lions' Den) and was formed in 1968 in Milan. Subsequently, the Inter Boys and the Red and Blue Commandos of Bologna were born, together with other groups which borrowed their names directly from the political language (starting from "ultras" in 1971 by Sampdoria supporters and going on to Tupamaros, Fedayn but also Folgore and Vigilantes, etc...). All these groups were clearly fascinated by the English hooligan model, and when English and Italian supporters met for a match, they had the chance of making comparisons: The first Italian Ultras began to identify themselves with a certain kind of clothes and a specific area of the stadium which consequently became off-limits for the other supporters. They also supported their team with endless choruses during the whole match and behaved violently towards the rival supporters. However, Italian "ultra" members could look up to another social model, namely the small political extremist groups, occupying the streets and the squares and representing a well visible model of militancy, clannishness and toughness. It is clear that the "ultra" groups tended to conform to the style of these political groups, adopting also their organizational and structural characteristics, together with some counter-cultural features. The influence can be seen in terms of spontaneous adherence of some "ultras" to extreme left-wing groups, although the latter never carried out systematic recruitment campaigns in the stadiums. The case of the "ultra" groups formed by extreme right groups was different. This happened at the following teams: Inter, Lazio and Verona. In these cases it seems that the Italian Social Movement, banned from the streets and squares, tried to take advantage of the antisocial rebelliousness in young football supporters, who gathered in the stadium curves, to influence their behavior. Thus in Milan, key members of the Italian Social Movement were the founders of the Boys Inter and in Rome there was a very high number of extreme right-wing militants among the Lazio "ultras"
It was a combination between a football culture which was less dependent on the working class supporters linking up with the political groups that determined the peculiar feature of the "ultra" movement. It was not exclusively based on a working class community (as the hooligans in England were), but represented different social classes. The "ultra" movement was made up both by "people having experimented with mass violence in the political field" (not only working class but also lower middle class and middle class people, not only left-wing but also right-wing) and by "people having experimented with violence in the fulfillment of everyday needs" (local gangs). Let's now examine more in detail some specific features differentiating the Italian groups from the European ones in this period. We will see that the mixture between football support and political activity was absorbed by the "ultra" groups, and was evident in their behavior patterns and in their organizational structures. Although the "ultra" groups were prone to violence (just like their English cousins) and they were friends or rivals of other teams following the traditional alliances or rivalries between the various teams, the political tendency of a team soon influenced these alliances or rivalries. For example: the Bologna leftist "ultra" group became hostile to the Verona rightist "ultra" group, while becoming twinned to the Milan "ultra" group who shared their left-wing tendency. Moreover, "ultra" members directly adopted the same clothes of political street groups: green parkas, camouflage combat jackets bearing team badges, blue jeans and balaclava caps or neckerchief on the face, all of which made the "ultra" look like an urban guerilla. Furthermore, in Italian stadiums supporters started to play tin-plate drums borrowed from trade union demonstrations, using them to accompany choruses. The slogans that football supporters endlessly chanted were also borrowed from politics. Banners and enormous flags typical of political demonstrations and marches started to appear in stadiums as well. The "ultra" group was also much more open towards the outside world than the hooligan groups; because of the counterculture tendency, the "ultra" group accepted a fairly remarkable number of women (absent in European groups) and carried out direct membership activities, like in political recruitment, aimed at increasing the number of members (beside self-financing activities). All these characteristics highlight a substantial organizational difference between these groups in Italy as compared to the English model. While English and other European curve (terrace) supporters mainly performed spontaneous activities (such as choruses, choreographies using scarves and all those acts that were carried out on the day of the game), Italian supporters felt that the collateral activities borrowed from politics and aimed at socializing and increasing curve support participation were a real priority. These activities entailed an organization that went beyond the Sunday match and involved midweek meetings where supporters worked at the creation and staging of spectacular flag waving, aimed at involving all the other curve supporters and at the production of various material to self-finance the group. In order to have an overall picture, some other features need to be underlined. The "ultra" members were similar to the first English hooligans in that they felt themselves deeply tied to the colors of their team and were strongly connected to the popular support culture. Therefore, they occupied the cheap seats, watched the match without ever sitting down, constantly drew inspiration from tradition. Thus, they revitalized the Naples custom to use petards, smoke bombs, and firecrackers when the teams entered the stadium, which became a spectacular element among their choreographies. They also brought back the tradition of staging the rivals' funeral, marching as in a funeral procession and following a coffin covered by the rival team flag. The retrieval of some popular support traditions, together with the other characteristics of the "ultra" support represented a strong attraction potential and a powerful identification instrument for the youngest supporters and made it easier to achieve an aim which was constantly pursued by these groups and which has also been borrowed from the political sphere, namely the continuous attempt to control, in an hegemonic way, the whole curve. These are the features that characterized the "ultra" movement which was born in the 1970s. As time went by, the development of this movement was constant and went hand in hand with a considerable increase in the clashes between rival supporters. However, it was only in 1975 and more precisely on 21st December 1975, that the "ultra" phenomenon demonstrated its deep roots among the main body of team support, to such an extent that the Italian Soccer Federation decided to call for a "friendship day" against the violent commandos, in the wake of violent clashes that had taken place during the 74/75 National League Championship. We are therefore approaching the period that can be defined as the second phase of the "ultra" movement and that goes from 1977 to 1983. During this period in the other European countries it is possible to notice an increase in violence due to the increasingly military style organization of the hooligan groups. Different factors contributed to this development, among them a greater need to plan clashes due to increased safety measures and tighter control by police, and last but not least, the growth of youth subcultures in the second half of the 1970s. Above all, the skinhead style became predominant in North European stadiums and, because of an increasing tendency towards xenophobia and racism [within the skinhead movement], this style made the most violent hooligan groups turn to more extreme right-wing positions. This at a time when right-wing groups were looking to influence and manipulate hooligan groups inside English and German stadiums as well. In Italy the dynamics were partially different from those that developed in other European countries. It is true that the "ultra" groups traditionally controlled by the right strengthened their position, however, the social scene and radical thinking was still completely controlled by the left. The groups that were strongly controlled by left wing leadership were not threatened by any kind of penetration from extreme right-wing groups. Even the advent of the skinhead style did not take off for some years and was confined to certain areas. Yet, even in Italy, violence increased but this can be put down to the decline of the political movements of the 70's, which had grown through people's anger and feelings of isolation and led to a fierce and violent explosion in 1977 culminating in bitter clashes with the police, right-wing groups and also between leftist movements themselves. Thus, as it happened in the squares during demonstrations, the stadiums saw an increase in the use of illegitimate weapons, knives, iron bars and rocket launchers. The names of the new groups were still influenced by the political situation of those years: many groups defined themselves as "Brigades". referring to the terrorist groups active in that period and several symbols belonging to left-wing terrorism appeared (for example the five-pointed star of the Red Brigades) and to right-wing terrorism (the two-edged ax which was the emblem of "Ordine Nuovo", i.e. New Order). It became more and more common for the ultra groups to stage clashes outside the stadiums, in order to avoid police control. The increase in violence was highlighted by the death of a Lazio supporter in 1979 before the beginning of the Roma-Lazio derby. That very day other violent clashes occurred causing several injuries in Ascoli, Milan and Brescia. However, in this period, the large ultra groups had practically gained complete control of the whole curve. Although the bellicose character was stronger and the level of the clashes was higher, the behavioral pattern activating violence followed the rule of "violence as an instrument" borrowed from politics. Before gaining entry to the elite or core elements of the group, through the larger peripheral support of the group, the inexperienced members had to pass a series of tests and to demonstrate their reliability not only from a military point of view, but also in terms of organization and general behavior. The exertion of violence occurred only during matches between teams whose supporters were historically hostile to each other and with large "ultra" groups. Therefore, recourse to violence was somehow controlled. If someone demonstrated themselves unable to move effectively, ignored the senior members, thereby endangering the safety of the group, he was left out and sent away. In the same period, the "ultra" membership increased, and these movements strengthened their organizational structures. These years saw the birth of the "Directorates", modeled on the lines of extreme left wing political parties. The function of the Directorates was to coordinate the ever increasing activities carried out by the "ultra" groups. At this stage, these activities corresponded to those typical of any organized club and were particularly devoted to organizing away matches and managing a certain number of tickets. "...'The leaders are eight including me... each one of us has their own tasks. Women mainly deal with the financial aspects and they are almost totally responsible for assembling of flags and drums. We deal more with relationships with the Team Management... There are specific tasks: organizing away matches, asking for prices, timetables and renting of buses, dealing with materials, for example mending flags and so on, buying stationery, stickers or T-shirts organizing support and being responsible for confetti and torches, going to the Team Management for the tickets and keeping in touch with the Team and also keeping relationships with other clubs. ....Concerning the funds, once we used to take general collections not just amongst ourselves and to sell our materials: T-shirts, stickers and scarves bearing ''ultra" on them. But then the Torino Team Management decided that this was not very elegant, told us to document our expenses and then refunded us." Between 1983-1989, the "ultra" movement reached even the stadiums of provincial towns and the teams playing in the lower Divisions, involving young people coming from all social classes. Conditions of social deprivation were not necessarily a prerequisite for ultra participation: on the contrary, in these groups there were people with good jobs and often with a high school level (degree, diploma) and also boys coming from well-to-do families, married men with a stable life. Often it was precisely in the small rich provincial towns that the toughest and most radical groups could be found, for example Ascoli, Cesena, Verona and Udine. In these towns the interaction between the "ultra" culture, logic and the traditional rivalries between towns and regions emerged clearly and in its most original way. During this period the "ultra" world became largely dominated by local and parochial pride, an element granting a strong identity. Before it had always been possible to connect the use of violence against intruders (such as rival supporters or the police) to the defense of the "ultra" territory (the curve, the town and the team colors), yet it was also connected to an atmosphere, a political tension that could supply a surplus of identity, cohesion and aggregation, based not only on the friend-foe logic. On the other hand, in the 1980's, with the decline of political movements, the situation was no longer the same. Thus, in these years, the main trend inside the "ultra" movements was the following: more importance attached to the regional or local identity and parochialism, to regional and local rivalries and historical hostilities, and detecting the "ultra" groups to be considered enemies. Their logic of the end as a freed space is replaced by that of the end as a small mother country. Therefore clannishness, toughness cult and paramilitary organization, together with the morbid link to the small mother country, all of which is very close to extreme right values, opened the way for an easy advent of racist and xenophobic behavioral patterns inside the stadiums. At the same time, the traditional large groups are faced with a crisis period. They had to face the strengthening of safety measures inside the stadiums. Controls on groups following away matches increased as well, together with control on places to be reached by "ultra" movements. Moreover, the first generation change took place among the "ultra" hierarchies. Some charismatic leaders, active also in the political world, left the curve, often because of the numerous repressive measures against them because of events occurring both in the stadiums and in politics. Some other members left the groups or lost their influence there because of drug addiction problems. In the meantime, the curves saw the birth of other groups, made up by very young boys (from 14 to 16 years), often disliked by the official groups. These new groups, however, succeeded in occupying their own area in the curve behind their banner. Their very names highlighted their different inspiration as compared to the groups which had formed during the 70's: in this period the new groups chose names such as "Wild Kaos". "The Sconvolts" (rough translation: "Upset People"), "Verona Alcohol", "Nuclei Sconvolti" (rough translation: "Upset Nuclei"). These groups were mainly interested in chances to fight and belonged to the excess and freak-out culture. Their model was not the metropolitan street guerrillerio, but Alex, the young super-thug in "Clockwork Orange", whose effigy started to appear in various curves, replacing the ''Che Guevara" portrait. The new groups were the result of a period in which civil society was dominated by hedonism, exhibitionism, disaffection for political and social commitment. The stylistic paradigm adopted by many new "ultra" members, often chauvinist, violent and intolerant, is that of the "paninaro" (similar in style to the casual). All these groups were formed between 1983 and 1985 and proved to be more skillful in escaping police clampdowns. They could easily baffle controls by changing their appearances and identities. They did not care about the existing alliances, breaking them or creating crises because of their uncontrolled behavior and they regularly used knives. Having these characteristics, a lot of these groups attacked the principle of "violence monopoly", that is to say, up to that moment, violence had been resorted to only in specific cases and according to precise rules, whereas these new groups' philosophy was pure violence, forceful action for its own sake, to be carried out always and anyway. Therefore, they became an alternative attraction for anyone giving priority to military actions inside the "ultra" group. However, while in other European countries the increasing trend towards specialization of the toughest and most aggressive groups led them to a degree of separation from the other supporters, in Italy this did not happen. Cut down the hours of work!